Russian-terrorist troops continue to carry out armed provocations and shellings of the positions of ATO forces and settlements located on the territories under Ukraine’s control. In the vicinity of Pisky and Avdiivka, illegal armed groups pushed forward several infantry groups under cover of fire from 82-mm and 120-mm mortars and inflicted a massive fire attack from small arms, including large-caliber machine guns, and then moved to the starting line under cover of mortar fire. This provocation was immediately followed by shelling of the specified area from ​​a 122-mm cannon artillery. Intense small-arms firefights have been recorded near the settlements of Luhanske, Sokolniki, Hranitne, and Mayorska station. Terrorists thereby probe the density of defense and fire cover at the front end of the ATO forces. Sniper-pairs of insurgents fire at observation posts and the posts of ATO forces in the vicinity of ​Krasnohorivka and Mariinka. The activity of armored groups of Russian-terrorist forces has been observed between the settlements of Mariinka and Shumy. In the vicinity of ​​Troitske, terrorists on three BMP-2 with the support of the AGS-17 attacked the positions of a stronghold of Ukrainian troops. With heavy machine gun fire, insurgents attempted to prevent the entry of Ukrainian ATGM detachments to a counter attacking tactical group of insurgents. After opening return fire, the armored group of an illegal armed gang quickly moved behind their left flank. In the seaside direction, an armed confrontation between advanced units of Ukrainian troops and an infantry group of terrorists has been observed between Chermalyk and Pavlopil. Insurgents tried to drive Ukrainian soldiers out of their positions. The attack was repulsed with return small arms fire. Short gunfights have been recorded near ​​the settlements of Svitlodarsk, Krymske, Donetske, and Shchastya, which resulted from tactical movement (rearrangement) of opposing forces and equipment at the forefront, as well as actions by sabotage and reconnaissance groups and raid teams. Russian terrorists continue to conduct active radio and aerial reconnaissance of combat formations of our troops. Use of UAVs has been observed near the left flank and the rear of the sector “A” (including drones coming from the Russian Federation), and in the seaside direction (north-east of Mariupol). Local observers reported the set-up of a radio intelligence station to the south of Donetsk, near the settlement of Olenivka. Another radio intelligence station has been discovered when moving from Yenakiieve to Horlivka. During the past 24 hours, the movement of 38 vehicles has been recorded mainly near Luhansk and Donetsk. The main area of equipment transfer were in the directions from Krasnodon and Rovenky towards the north (Luhansk), between Luhansk and Lutuhyne, from Alchevsk and Perevalsk towards Stakhanov and Pervomaisk, from Debaltseve towards Horlivka. Inside the Donetsk “hub,” transfers primarily across from the frontline have been observed between the Petrovskyi and Kyivskyi districts of Donetsk; also, a supply convoy of up to 13 vehicles, including refueling tankers and mobile repair shops have been recorded. 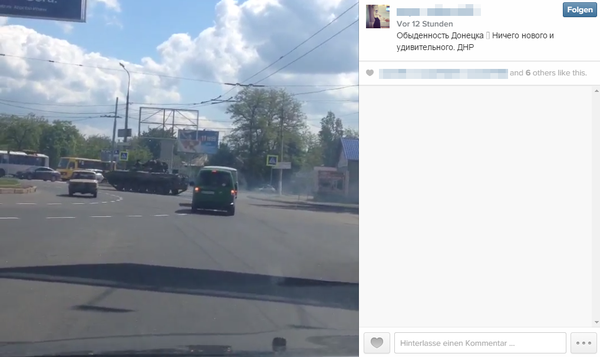 Russian army on the move in Donetsk today. “The commonness of Donetsk. Nothing new or awesome. DNR.” Source. Increased traffic has been observed between Starobesheve, Ilovaisk and to the south (mainly single vehicles or small 2-3 vehicle convoys), also vehicles loaded with boxes of ammunition were observed moving in the direction of Dokuchajevsk. The “Prizrak” [“Phantom”] gang that arrived in Alchevsk earlier (up to 80 people, about 6-7 armored combat vehicles and 3 trucks) departed to the northeast. The gang is expected to arrive in the Novotoshkivske – Donetsk stretch. The arrival of four self-propelled artillery units has been observed at the rebel positions north of Makiivka. The presence of two reinforced terrorist battalions has been recorded in the area between the settlements of Vesela Hora and Mykolaivka northeast of Luhansk. Battalions include 22-24 tanks, 46-48 armored combat vehicles, several smaller units with light armored vehicles (up to 25 units), 25 cannon artillery units and 16 MLRS; battalions are regularly reinforced with equipment and personnel. In the second echelon of Russian-terrorist troops, integrated units staffed with Russian servicemen have been observed (their number fluctuates, on a regular basis, there are up to 1,000 people). Luhansk is practically the supply base for the rear. Given the task force concentrated near Slovyanoserbsk (also up to a reinforced battalion in size with 12 tanks and 25 ACVs), it is important to note the concentration and deployment of an integrated insurgent brigade north of Luhansk. Terrorist units operating in the direction of Stanytsia Luhanska and Shchastya are managed and coordinated by a single command post; the advanced observation post has been observed near the settlement of Obozne. Mobilization of Russian-terrorist units continues in the seaside direction. 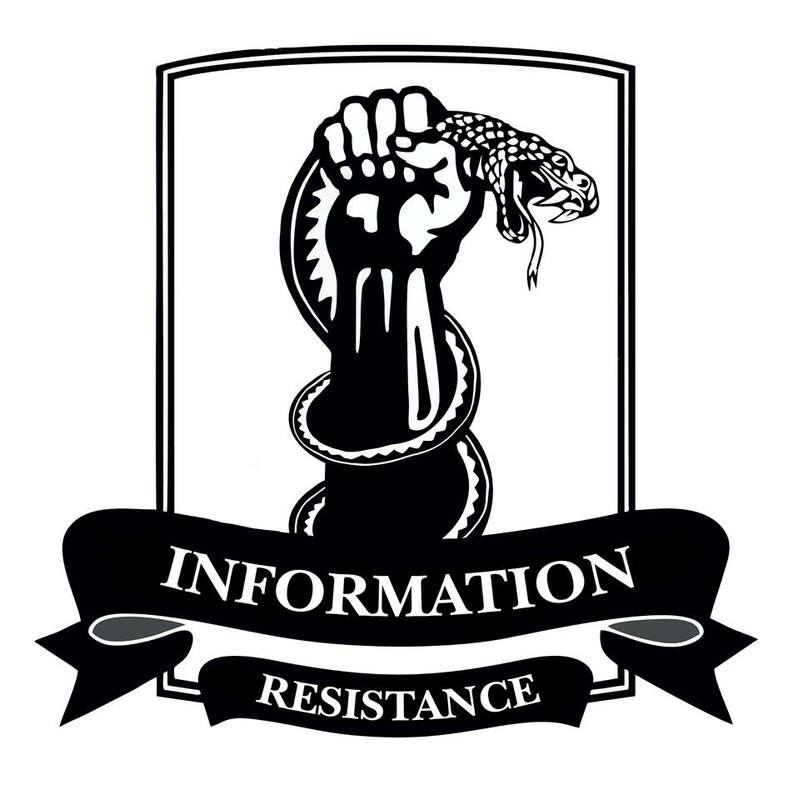 Insurgent command is trying to accumulate its tactical reserve for the units fighting in the area of Shyrokyne, near Bezimenne and north of it. Another integrated battalion tactical group of terrorists is concentrated across from Pavlopil and Chermalyk. It includes 14 tanks, 26 ACVs with infantry, and a large number of vehicles. This unit operates in the vicinity of Shyrokyne on a rotating basis. Reinforced tactical insurgent groups, part of two battalion tactical groups, are deployed in the Petrovskyi district of Donetsk, in Spartak, and in the north-western part of Horlivka. Most of the armored vehicles got pulled back and are gathered in a few parks for combat vehicles, mainly on the territory of industrial plants or logistic terminals. Periodically, this military equipment gets deployed to the frontline in small batches. During the past 24 hours, the excitement over the alleged “closure of a supermarket chain “Brusnichka”” has been observed on the occupied territory. Buyers literally swept everything off the shelves. After a series of firefights between sabotage and reconnaissance groups from the “Prizrak” gang and Ukrainian units in the vicinity of Krymske, Donetsk, Novotoshkivske and the 29th checkpoint, up to eight transports of wounded insurgents, mostly with bullet wounds, have been admitted to hospitals in Stakhanov and Alchevsk over the course of a few days. A significant number of looting “militiamen” from disbanded or “eliminated” formations has been observed on the stretch between Snizhne and Donetsk (Torez, Shakhtarsk, Zugres). Looters who have no centralized leadership and means to leave the area of ​​the ATO, gather in gangs that rob and plunder. Local “commandant offices” of terrorists have repeatedly attempted to eliminate them, but to no avail. The military command of the “LNR” [Luhansk People’s Republic] has firmly decided to combat alcoholism among the insurgents. Drunkenness will now be punished with harsh disciplinary measures – arrest and some “socially useful” work, as well as newly instituted penalties – fines and reduction of cash allowances. A fall in “earnings” has been observed in several armed gangs down to 1,500-2,000 Hryvnias [69-91 USD] a month. Several illegal armed formations have ceased payments altogether – the payment delay exceeds 2 months. This entry was posted in Dmitry Tymchuk, English, English News, South&Eastern Ukraine, War in Donbas and tagged #FreeKolchenko, #FreeSavchenko, #freesentsov, #RussiaInvadedUkraine, #StopRussianAggression, #UkraineUnderAttack, Dmitry Tymchuk, Information Resistance, Ukraine. Bookmark the permalink.